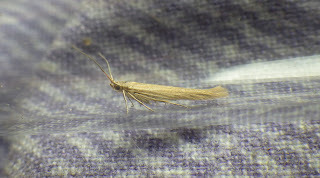 Following on from my previous blog (`Saltmarsh Stroll`), I have now taken photos of a Coleophora sp. 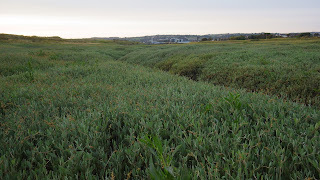 that I saw in abundance in the virtually homogenous beds of Atriplex (Halimione) portulacoides on the saltmarsh at the North Dock dunes and saltmarsh LNR, Llanelli on Tuesday night. A possible contender is Coleophora salinella, as the host plant is correct. It`s not C. salicorniae (a glasswort feeder, a plant that is scarce at this site), as it does not have the antennae thickened at the base. However, there are other Coleophora that occur on saltmarshes and some even on Atriplex, such as C. adspersella, C. versurella and C. atriplicis. The individuals were quite abundant at dusk (at c 9.00pm), moving around and flying low over the `canopy` of the sea purslane plants. They were out right in the middle of the stands of the plant, well away from the strandline and terrestrial influences. 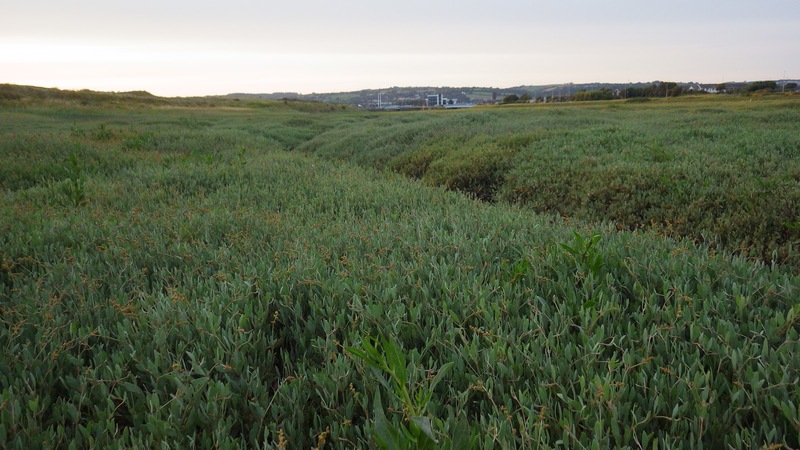 Yesterday evening, I also paid a quick visit to the saltings at Pembrey, where again, I collected Coleophora over sea purslane; I also saw a solitary rosy wave. I have retained specimens of both the North Dock and Pembrey Coleophora. Whatever species it is, all I can say is that Coleophora are frequent over sea purslane at present, if anyone wants to check their local saltmarshes. I have not looked critically at my specimens in order to achieve identification. Left click on pics below to enlarge. 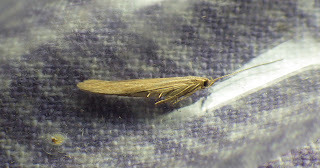 Above: the Coleophora sp. and its habitat. Apart from a couple of traps in the garden, I also put out four other traps last night (Weds, 17/7 - one in a suburban garden and three in mixed woodland) and whilst there were some fairly useful records, there was nothing to do the `Highland Fling` about! I`ll blog when I get a chance...off to the daily chores now.